Phonics is a critical part of a pupil’s reading journey and it is essential in the early stages it is taught correctly. At Oakthorpe we follow the Letters and Sounds programme of teaching. Children receive daily phonics sessions in the Early Years and KS1. These daily sessions are around a 25 minutes session which is whole class based. Children in need of additional support are identified early and given extra support through intervention. Phase 1 develops children’s ability to hear and distinguish sounds around them. It focuses on oral blending and segmenting, rhyming and alliteration. Phase 2 introduces letter sounds for reading and writing with sets of letters bring taught weekly. It begins to look at blending for reading and segmenting for writing. A selection of ‘tricky’ words are taught during Phase 2 that children need to be able to read by sight. Phase 3 introduces the rest of the individual letter sounds not taught in phase 2 and introduces digraphs and trigraphs. Children will continue blending and segmenting and further tricky words are taught. Children will also learn the letters of the alphabet during this phase. Phase 4 helps children build upon their previous understanding of blending and segmenting and children will gain experience of using words that have adjacent consonants such as ‘trap’, ‘milk’ and ‘train’. No new sounds are taught in this phase. 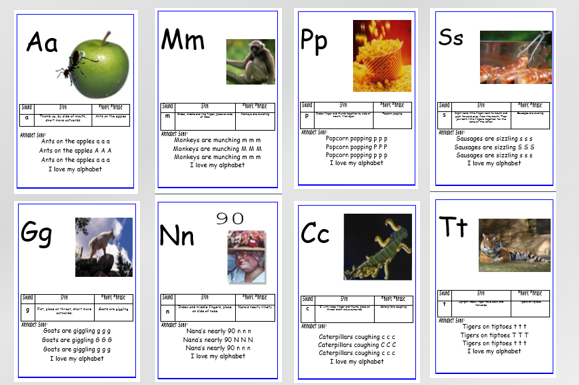 Phase 5 introduces alternative graphemes for phonemes e.g. Children will now know /ai/ as in rain from phase 3 but they will learn that /ay/ as in day and /a_e/ as in make also make the /ai/ sound. They will also learn alternative pronunciations for graphemes such as /ea/- tea and break. Phase 6 allows children to become fluent readers and accurate spellers. Alongside the Letters and Sounds programme we use ‘Visual Phonics’ for Phase 2 phonemes. This approach teaches children not only the sound the letter makes but also focuses on speech and language development, teaching children how the sound is formed correctly. Visual Phonics flashcards include a visual, a song and an action. It incorporates speech and language support for ALL children. This year we have been given funding from SHINE Educational Trust to explore Visual Phonics further and work with a speech and language therapist to extend its use through all of the Letters and Sounds Phases.